Many Toradex Carrier Boards contain a holder for a backup battery. It is used to keep the RTC powered for uninterrupted timekeeping while primary power is disconnected. Some modules provide battery charging functionality. Therefore, when using a single non-rechargeable voltage source, the inline diode and resistor will still be required to protect the supply from reverse current. 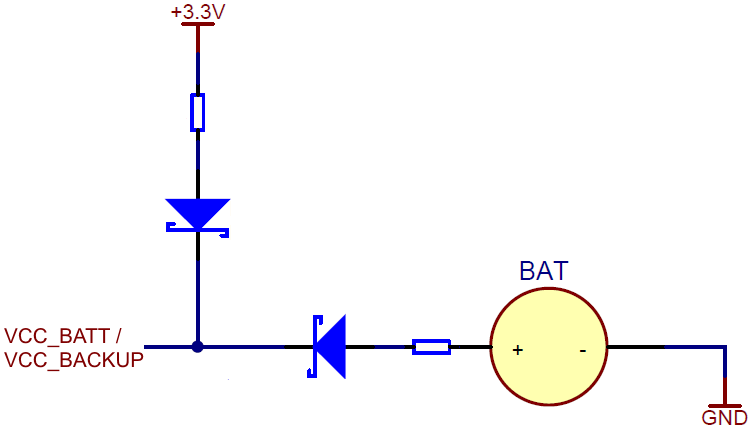 A FET may also be used for reverse current protection. Take care to ensure the circuit's reverse leakage current is low enough for safe operation with the chosen battery/power supply. High quality and/or redundant diodes should be used to safeguard against component failure which could result in battery fire/explosion.